In late 1980 Keith Einstein and his wife Judy packed their belongings, along with their two cats, hopped in their car and left Buffalo, New York for Dallas, Texas to open a printing business. 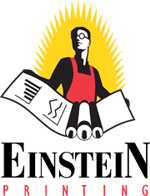 Like many other small businesses, Einstein Printing has evolved over the years. "In the beginning we were strictly a quick print shop. One color, preferably black, was all we knew," says Keith Einstein. "Along with printing and copying we did a lot of blueprinting. Most of our customers were involved in real estate development." The real estate crash in the mid '80s was a period Einstein Printing was lucky to have survived. "We came close to closing our doors a couple of times, but somehow we made it." It was a lesson Keith Einstein was not soon to forget. Einstein Printing became a much leaner and more focused company. Realizing a need for higher quality printing was not being met in the quick print market, Einstein Printing set out to fill that need. To raise the level of quality substantially higher, Keith Einstein began hiring top notch employees and buying more sophisticated equipment. The result? A business that bridged the gap between traditional commercial printing and quick printing. "I wanted to offer a service that provided a high level of quality and knowledge but was still responsive to shorter deadlines and price points more in line with quick printers." Keith continued, "We developed the attitude that we're going to help our clients be successful." Today Einstein Printing enjoys the privilege of being in on the planning stages of their customers' projects, guiding them through the most cost effective, appropriate solutions to their printing challenges. States Einstein, "There is nothing more satisfying than showing your client where he can save a bundle of money; everybody gets really excited about that." Even more than saving clients money, Einstein Printing strives to make the print buying experience as stress free as possible.